What is the minimum configuration for a router interface that is participating in IPv6 routing? What command will enable a router to begin sending messages that allow it to configure a link-local address without using an IPv6 DHCP server? Verify that the serial 0/0/1 interface is active and available. Refer to the exhibit. This network has two connections to the ISP, one via router C and one via router B. The serial link between router A and router C supports EIGRP and is the primary link to the Internet. If the primary link fails, the administrator needs a floating static route that avoids recursive route lookups and any potential next-hop issues caused by the multiaccess nature of the Ethernet segment with router B. What should the administrator configure? Create a fully specified static route pointing to Fa0/0 with an AD of 95. 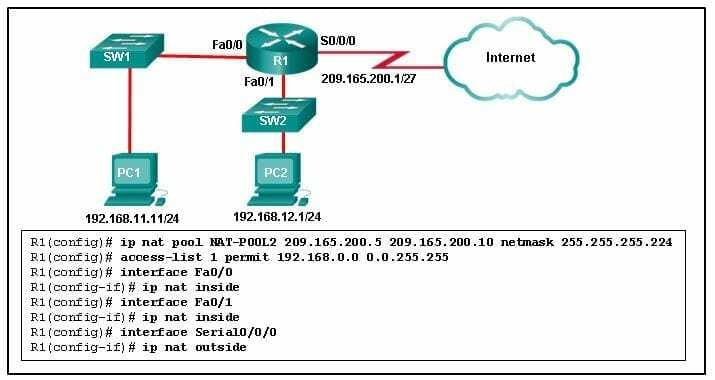 To enable RIP routing for a specific subnet, the configuration command network 192.168.5.64 was entered by the network administrator. What address, if any, appears in the running configuration file to identify this network? Which network design principle focuses on the capability of on-demand seamless network expansion in a switched network? A lab in a network management software company is configuring a testing environment to verify the performance of new software with different network connectivity speeds, including FastEthernet, GigabitEthernet, and 10 GigabitEthernet, and with copper and fiber optic connections. Which type of switch should the software company purchase to perform the tests? Which statement correctly describes how a LAN switch forwards frames that it receives? A company security policy requires that all MAC addressing be dynamically learned and added to both the MAC address table and the running configuration on each switch. Which port security configuration will accomplish this? A network technician is configuring port security on switches. The interfaces on the switches are configured in such a way that when a violation occurs, packets with unknown source addresses are dropped and no notification is sent. Which violation mode is configured on the interfaces? After sticky learning of MAC addresses is enabled, what action is needed to prevent dynamically learned MAC addresses from being lost in the event that an associated interface goes down? Refer to the exhibit. A small business uses VLANs 8, 20, 25, and 30 on two switches that have a trunk link between them. 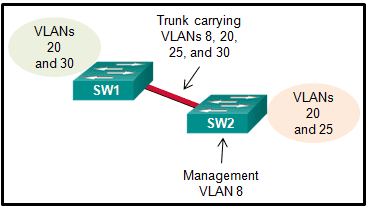 What native VLAN should be used on the trunk if Cisco best practices are being implemented? A technician is configuring a switch to allow access both to IP phones and to PCs on interface Fa0/12. The technician enters the interface command mls qos trust cos. What is the reason for including that command? It is used in conjuction with STP PortFast to ensure that interface Fa0/12, in case of a shutdown, regains an "up" state immediately. It is used to set the trusted state of an interface to allow classification of traffic for QoS based on the CoS value of the IP phone. Which command is issued in the VTY line configuration mode to apply a standard ACL that will control Telnet access to a router? Refer to the exhibit. The users on the LAN network of R1 cannot receive an IPv6 address from the configured stateful DHCPv6 server. What is missing from the stateful DHCPv6 configuration on router R1? The FA0/0 interface is missing the command that informs the clients to use stateful DHCPv6. Refer to the exhibit. NAT is configured on R1 and R2. The PC is sending a request to the web server. What IPv4 address is the source IP address in the packet between R2 and the web server? Refer to the exhibit. A company has an internal network of 192.168.10.0/24 for their employee workstations and a DMZ network of 192.168.3.0/24 to host servers. The company uses NAT when inside hosts connect to outside network. A network administrator issues the show ip nat translations command to check the NAT configurations. Which one of source IPv4 addresses is translated by R1 with PAT? In IPv6, all routes are level​​​ …………. ultimate routes. The acronym …………… describes the type of traffic that requires a separate VLAN, strict QoS requirements, and a one-way overall delay less than 150 ms across the network. These restrictions help to ensure traffic quality.